Many investors are too optimistic. They might believe the stock market delivers average gains of 8% to 10% a year. That’s because the average annual return, in the long run, often falls in that range. But that’s not the return average investors see. That average annual return covers decades, and often more than 100 years of data. Be honest. None of us are going to access our accounts 100 years from now. Average annual returns assume an investor makes one investment and holds that position forever. That’s unrealistic. To see what average investors really earn, we can look at 20-year rolling returns. Instead of assuming all investors buy at the same time, rolling returns consider every time period within the data. For rolling returns, we look at buying on January 1 of Year 1, February 1 of Year 1 and so on all the way up to December 1 of Year 20. This accounts for all the 20-year returns beginning at the start of the data. It shows what an investor could realistically expect. And it’s not 8% to 10% a year. 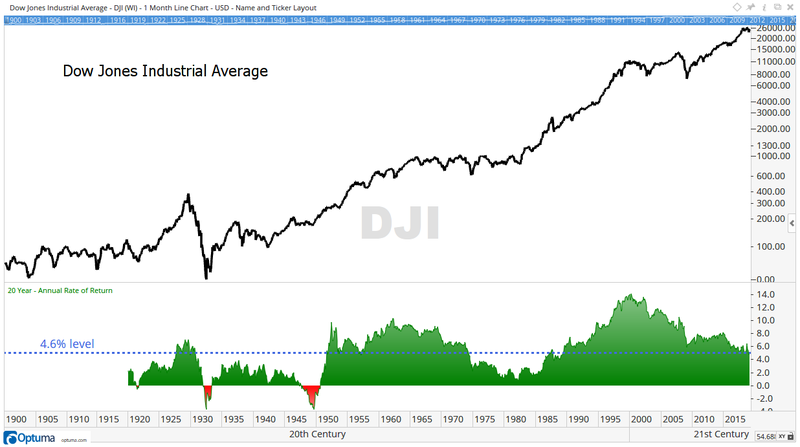 Since 1900, the average 20-year rolling return on the Dow Jones Industrial Average was 4.6%. The chart below shows all rolling returns. It takes 20 years to find the first data point. After that, there’s a new data point each month. The chart shows 1,187 rolling periods. Most of the time, returns are above or below average. Investors reaped above-average gains for most of the past 42 years. We’re likely to see below-average gains in the future. The chart also shows the time from 1994 to 2007 was unusually kind to investors. Even with a bear market in 2000, investors consistently averaged double-digit gains. Before 1994, just one month showed that type of gain. The 20 years ending in March 1962 showed an average gain of 10.3%. Something was different in the 1990s. The next chart shows what that was. This chart shows the average dividend yield on stocks since 1925. Notice the big drop in yields in the 1990s. The yield averaged 4.5% between 1925 and 1982. Since then, the average has been near 2%. As yields dropped, stock prices rose. That’s because investors paid more for each dollar of income. This made sense since interest rates were falling over that time. Now, interest rates are rising. That means investors aren’t likely to pay as much for stocks. Lower valuations yield lower rolling returns. The second chart also shows that dividends accounted for most of the stock market gains prior to the 1980s. With low yields now, investors should expect lower-than-average gains in the future. You might be questioning the data by now. This all conflicts with conventional wisdom. There’s a reason for that: Conventional wisdom about stocks is wrong. Most individual stocks lose money in the long run. By one count, about 26,000 different stocks changed hands since 1926. More than half of them lost money. Just 4.3% of individual stocks account for 100% of the market’s gains. Stock picking was always challenging. Long-term investors face incredibly long odds in the future. Yet many investors believe they’ll make 8% to 10% in the long run. They probably won’t. The next 20 years look more difficult than usual. It’s time to question your assumptions. Consider different strategies. It’s time to look at short-term strategies. It’s time to learn how to trade. Most important, it’s time to ignore conventional wisdom. Data shows stocks aren’t usually great long-term investments. They are, however, great short-term trades.